Head of Research Department at CDP, she manages the analysis concerning macroeconomic and sustainable development, industrial and infrastructure sectors, supporting the Top Management and Business Units on strategic projects. 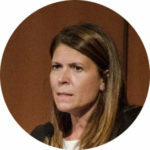 She is Member of Board of Directors of CDP Investimenti Sgr and previously was in Terna S.p.A. Mrs Camerano was Head of Regulated Sectors and Infrastructure Unit at UniCredit S.p.A. and she served as Head of Research Unit at Mediocredito Centrale. She holds a Political Science Degree at Sapienza University of Rome.